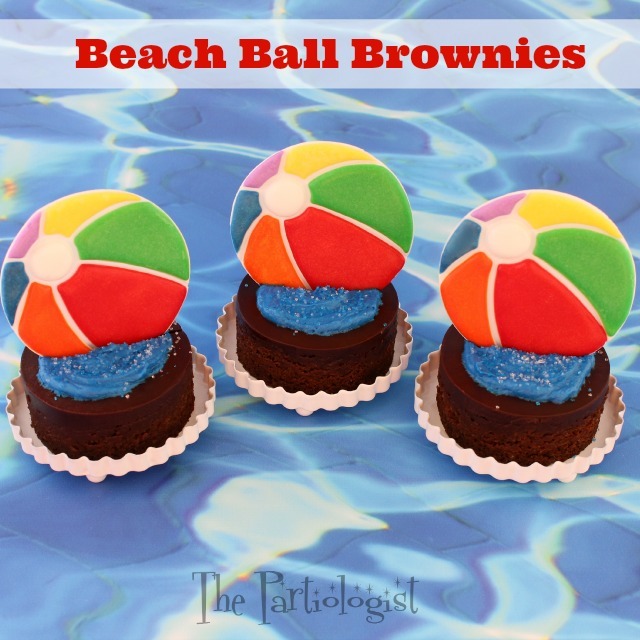 The Partiologist: Beach Ball Brownies! Here's how to make your beach ball brownies. 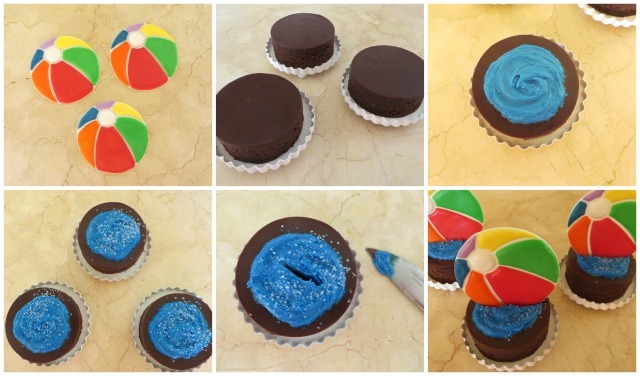 Using the beach ball cookie cutter (below), cut white beach balls out of fondant. Pipe on colored royal icing to make the beach ball pattern. Let set overnight or until hard. After baking and frosting the brownies, let them cool. Take a round cookie cutter and cut out circles from the pan of brownies. Top each brownie with blue frosting and sprinkle with white and blue sanding sugar. 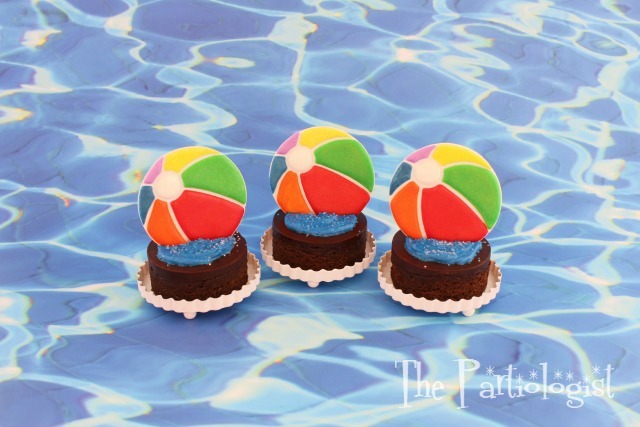 Cut a slit in the top of the brownie, making a place to hold the fondant beach ball. The day before the pool party was scheduled, I decided to add more cupcakes. Because who doesn't want more cupcakes? Mini beach balls from Oriental Trading were the perfect way to edge the sides of the pool, next to the cake stand holding the cupcakes. I made chocolate life rings with red candy melts and a mold. Frosted the top of white cupcakes in blue and added the ring. Cut out polka dotted cupcake liners with my Cricut. 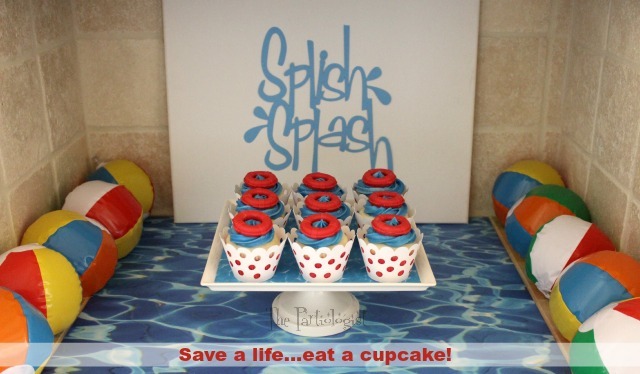 Save a Life...Eat a Cupcake! I hope I made a Splash! 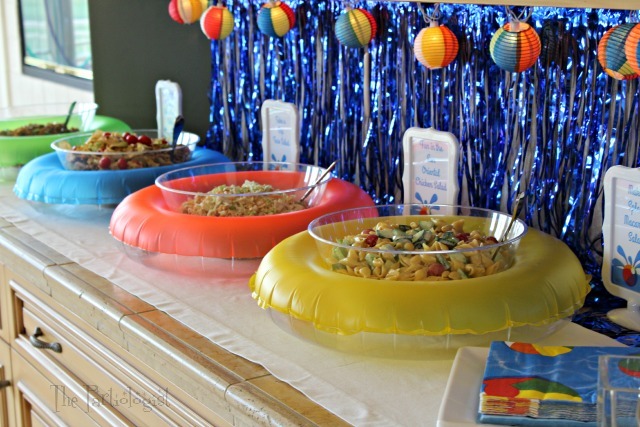 So many amazing pool party treats to choose from. I don't know where I would have started, but I know I would have filled up on all the goodies. Thanks Beth, I think we all filled up on the goodies!! 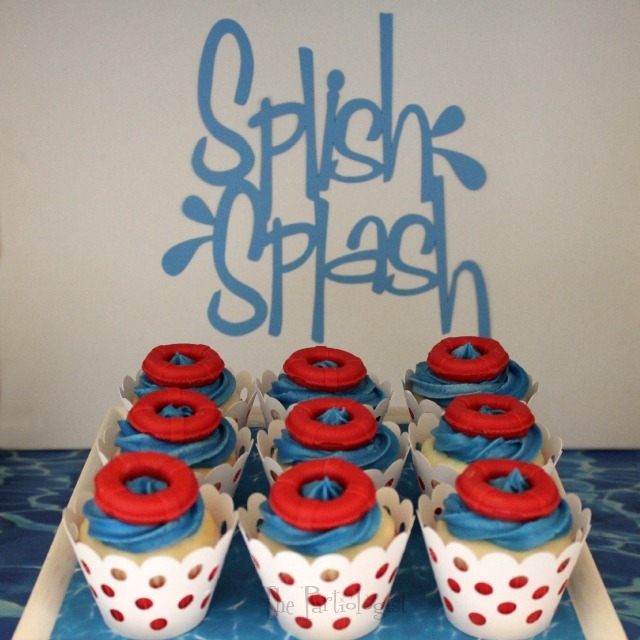 You made more than a splash - cannonball! I love it all! Thank you so much Christine - have fun at your pool party! You are one of the most creative people I have ever met! ;) Love your ideas! What a fun party. It's the middle of winter over here and I'm wishing I could join in your pool party fun. 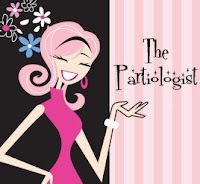 I would love for you to join in my pool party fun, thank you Linda! Love how you made the beach ball. So creative! Love the texture look of the brownies. You didn't mention anything about a brownie recipe. Is that something you will share? Oh Lexy, thank you for the comment. Right now, the brownie recipe is a recipe I have in my vault (LOL). I know the time will come and someday I'll spill the beans!